Have you experienced Happy Holidays Motorhomes? Help others learn about this company by sharing your first-hand information with other road-trippers. A family enterprise based in Gibsons, BC, Happy Holiday Motorhomes focuses on a limited fleet of fully-equipped Class C motorhomes. 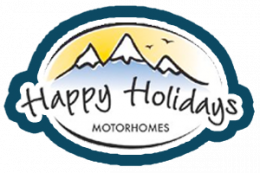 Happy Holiday Motorhomes is a full-service RV rental run by a family, offering quality and personalized service, starting from speedy replies to free pick airport pickup and returns (even on Saturdays). Other perks include free personal items like kitchen utensils, cupboards, linens, and more. 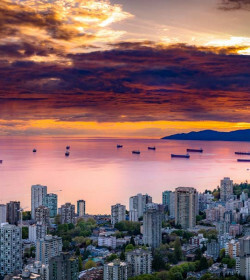 Nestled in Gibsons on the Sunshine Coast, their RVs allow you to significantly tour B.C. mainland and Vancouver Island. Stocked with a rental range of small, medium, and large motorhomes, the company’s fleet revolves around automatic Class C motorhomes. 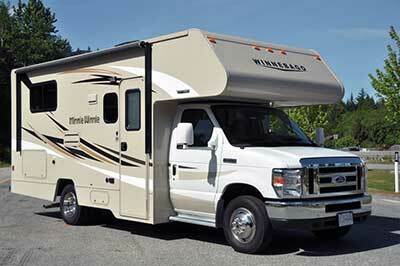 From 22’ to 31’, couples to large groups can pick their preferred units in comfort. 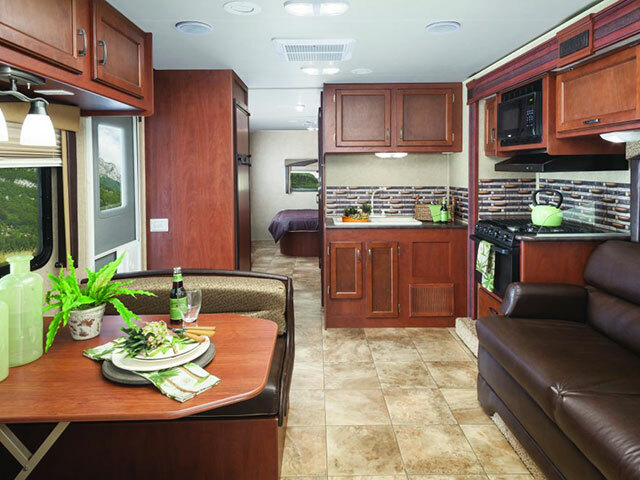 Free convenience kits for two are already included in your motorhome rental, which includes bedding, towels, dishes, cookware, first aid supplies, lawn chairs, and the like. If you’re traveling with a child, they have child seats or booster seat. 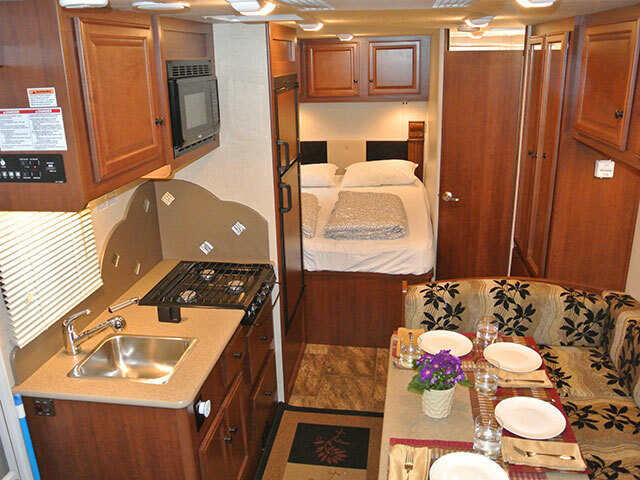 Even if this is considered the smallest RV on offer, the unit can accommodate a family of 5. 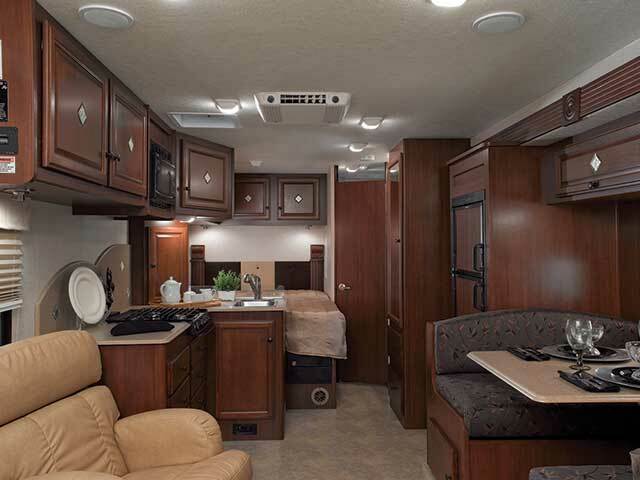 Like most traditional Class C motorhomes, sleeping areas include the permanent rear bed, cabover bed, and dinette bed. Also at the back area is the bathroom. Because of the slightly limited length, this unit may not spell privacy. Still, you’ll get the comfort and convenience you need. If you’re a family of 5 wanting some extra space, the 24’- 25’ units can give you something to look forward to. 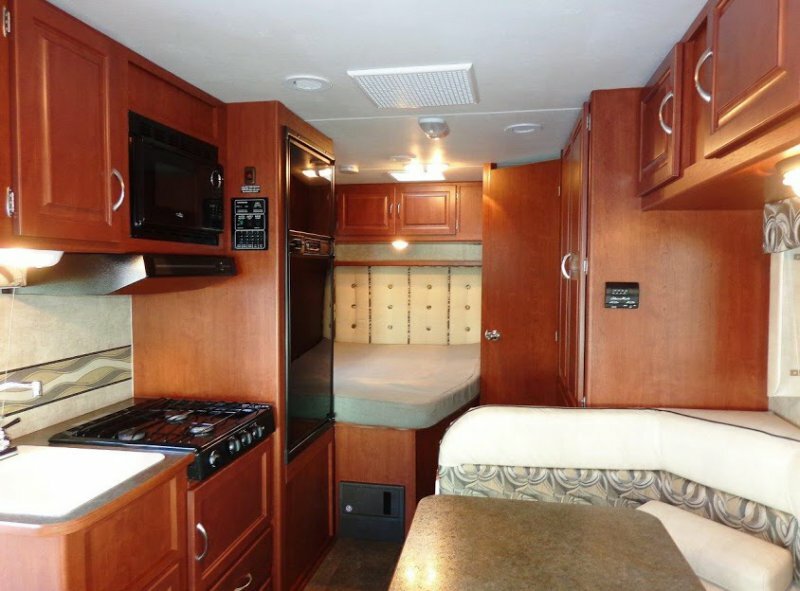 Though still without a slide, this medium motorhome is way comfortable, plus it comes with bigger storage for your clothes and some extras like patio awning and light, and outdoor shower. And instead of a traditional dining area, you get a wrap-around dinette that also converts into a bed. And if you think the previous motorhomes are way too small for your entire family, then you’ll fall in love with the bigger and more spacious version at 26’- 27’. 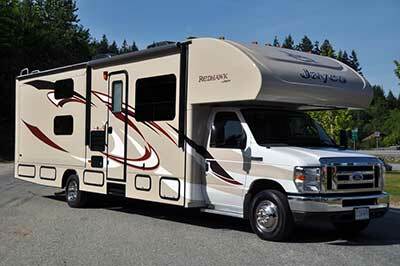 Now with slide-out, this Class C RV accommodates up to 6 persons. The extended width and length mean roomier interior and inclusion of extra facilities like the freestanding rocker recliner near the entry door. 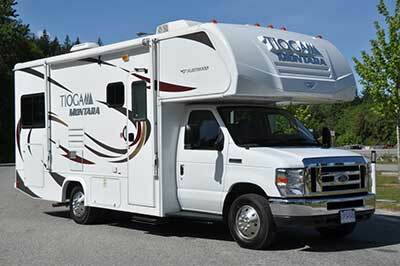 For bigger groups up to 8, there are motorhome options at 31’- 32’. Featuring two slide-outs, these units come with a bunk bed, convertible side dinette, and sofa bed. You can comfortably move around inside because of the spacious layout. The L-shaped kitchen is equipped with a 3-burner range with oven, microwave oven, fridge and freezer, sink and storage cabinets. If you love the interior, you’ll also appreciate the exterior features, including the door side patio receptacle, electric retractable steps, and electric patio awning. The basic liability insurance is included in the rental but does not cover damage to tires and rims. The insurance deductible amounts to $4,000, which should be deposited before departure via pre-authorized credit card. You can reduce the excess to $600 by purchasing Collision Damage Reducer at $20 per day. On top of the insurance deductible, the company requires a security deposit of $500. Happy Holiday Motorhomes may not be as big as other RV dealers but they make sure to keep up with the competition through their quality and personalized service. 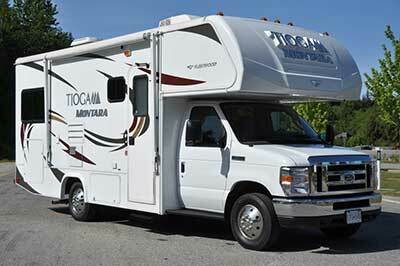 Plus, they have more than 3 decades of solid experience in RVing. In return, their reputation is a knockout even if they only have a few RV options. It is because their limited fleet allows them to be more hands-on with every rental. For personalized and nothing off-the-peg rentals, you’ll get what you’re looking for a motorhome with Happy Holidays Motorhome. Surely, they make it a point that it’s the little things that make your trip worthwhile. Have you experienced Happy Holidays Motorhomes?